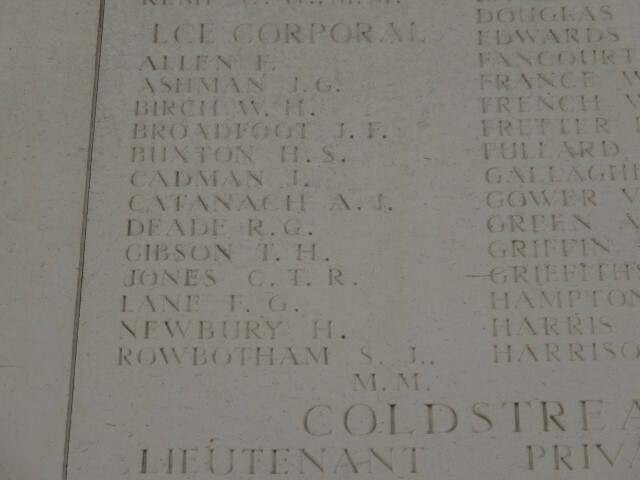 28030 Lance Corporal Thomas Hubert Gibson 4th Battalion, the Grenadier Guards was killed in action 13 April 1918 and is commemorated on the Ploegsteert Memorial, Belgium. He was 24 years old and is commemorated on the West Auckland War Memorial and the Roll of Honour in West Auckland Memorial Hall. In 1901, the family lived at New Street West Auckland where 29 year old Mathew worked as a coal miner (hewer). By 1911, the family lived at 18 Spring Gardens, Mathew still worked as a coal miner (hewer)and 16 year old Thomas worked as a farm hand and 14 year old Mathew as an office boy. By 1916, Thomas was employed as a miller and the family lived at 3 Spring Gardens. 29 November 1916: mobilized and joined the Grenadier Guards the next day at Caterham and given the service number 28030. 13 August 1917: promoted to Lance Corporal whilst with the 5th Battalion. The Division was involved in the First Battles of the Somme 1918, particularly the Battles of St. Quentin, Bapaume and the First Battle of Arras throughout March 1918. The War Diary provides the following details. 9 April: a fatigue party of 170 men under Major Walker MC digging trenches. 10 April: Sound of heavy firing from the Bethune – Estaires district. Evening: received orders to proceed northwards to take part in the battle around Merville and Armentieres. The prevailing situation was such that following the German attack 10 April on the British and Portuguese Lines around Armentieres, troops were rushed up from all directions to stem the German on-rush. By nightfall 11 April, the Germans had advanced about 10 miles forcing the British troops back. There appeared nothing to prevent the enemy from reaching Hazebrouck the next day. 11 April: 9pm, 4th Guard Brigade arrived at Strazeele. The orders given to the Brigade were to stop the German advance towards Hazebrouck at all costs. 12 April: by dawn the brigade held a line about 2½ miles in length with 3rd Bn., Coldstream Guards on the right, the 4th Bn., Grenadier Guards on the left and the 2nd Bn., Irish Guards in reserve. As soon as it was light the Germans opened heavy fire with field guns and machine guns and recommenced their advance. They attempted to get into Nieppe Wood about 1800 yards in front of them but their advance was repulsed twice by the Guardsmen. A counter attack by 2 companies of the Irish Guards on the right, 3rd Bn., Coldstream Guards in the centre and 4th Bn., Grenadier Guards on the left advance and attacked along the brigade front. It met with heavy opposition and was unable to progress very far but achieved its objective in preventing the enemy to advance for several hours. No.2 Company 4th Bn., Grenadier Guards under the command of Captain T.F. Pryce MC captured the small hamlet of Pont Rondin. 3pm: the enemy renewed his attacks all along the line and the situation became very critical as he drove into a portion of the brigade front but swift action by No.2 Coy, 3/Coldstream Guards and a company of 2/Irish Guards drone back the enemy and held the position. Just before dusk, the enemy mounted another attack but the Guardsmen again held firm. Darkness brought welcome respite. Orders were received to continue their resistance at all costs. The 1st Australian Division was being rushed up to form a defensive line. The plan was for the Germans to be held at all costs while a strong line of defence was formed about 1000 yards behind the fighting line. The Australians would not be ready until the following evening so it was the duty of the Guards Brigade to hang on until that time. 4th Bn., Grenadier Guards had lost 8 officers and 250 other ranks but the remainder was required to cover an increased frontage. Night-time was spent readjusting the line, replenishing ammunition and preparing for the conflict ahead. 13 April: at dawn the enemy renewed his attack and assisted by fog, he was able to bring up light machine guns and work into intervals along the British posts. Throughout the morning repeated attacks were made and driven back by determined Guardsmen. Shortly after noon, troops on the left of the 4th Guards Brigade holding the village of La Couronne were driven back by a heavy concentrated German attack. The village was soon occupied and consequently the enemy found a way to attack the Grenadiers both from flank and the rear. No.2 Company under Capt. Pryce was surrounded but continued fighting, holding up the German advance and sacrificing themselves. A surviving Corporal informed that at 6.15pm Capt. Pryce with no ammunition, surrounded and the enemy within 80 yards of his position, ordered his Company, then 18 strong to charge with the bayonet. They drove back the enemy, not once but twice before his reinforcements turned the tide in favour of the German attack. Captain Pryce was seen fighting in a hand to hand struggle against overwhelming odds. By nightfall, the Germans were able to call themselves “masters of the field” but only to find that the 1st Australian Division has secured an impenetrable barrier. Lance Corporal T.H. Gibson served with No.4 Company and by the evening of the 12th had lost over 60% of their effectiveness as did No.1 Company. The battalion had fired 20,000 rounds of ammunition and all the rifle grenades. With the battle over, the 4th Guards Brigade had accomplished its objective and the 1st Australian Division was now holding along the Bois D’Aval and north of it. The remaining companies of the 4/Grenadier Guards, who had lost all their officers, were surrounded and the unwounded survivors, 60 in number, were taken prisoner. The total casualties of the battalion were 504 Other Ranks (90% of its strength). The Coldstream Guards lost a similar number and the Irish Guards about 300. Total Brigade casualties were 39 Officers and 1,244 Other Ranks. The Casualty List was amended by hand to show that Lieut. C.C. Burt was wounded and missing and that 1 OR died of wounds and 21 ORs previously listed as missing were wounded. Casualties amounted to 526 officers and men, 122 other ranks belonging to No.4 Company including Lance Corporal T.H. Gibson were listed as missing. A later report  records that all officers except Lieut.-Col. W.S. Pilcher DSO and Captain C.R. Gerard were casualties, 6 killed, 6 wounded and taken prisoner and 5 wounded. 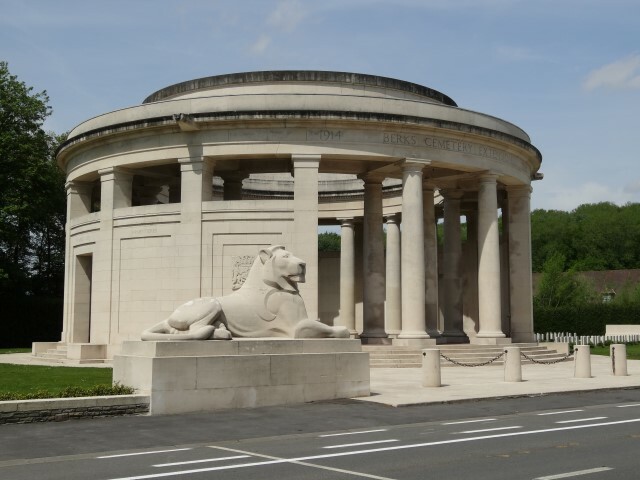 Later research records that between 12 and 14 April 1918, the 4th Bn., Grenadier Guards lost 4 Officers and 115 Other Ranks killed in action or died of wounds including Lance Corporal T.H. Gibson. Lance Corporal Thomas Hubert Gibson is commemorated on the West Auckland War Memorial and the Roll of Honour in West Auckland Memorial Hall. 25 April 1918: letter from Col. F.M. Arthur to Lieut.-Col. W.S. Pilcher. Many brave and gallant men were having a very long rest indeed.